Invite us to speak at your meeting, event or training! We will be happy to give an introductory presentation to your group. Contact us to discuss your needs, possible presentation topics and time frame. Here is a short list of topics we currently offer. Presentation lengths vary between 45 minutes and 1.5 hours, although we can modify the length according to your time frame. Call us at (503) 222-7645 or email us to set up a presentation! 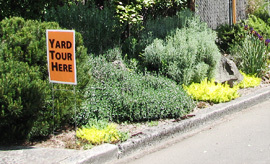 A great way to see Naturescaped yards in person, and talk with the gardeners who created them!